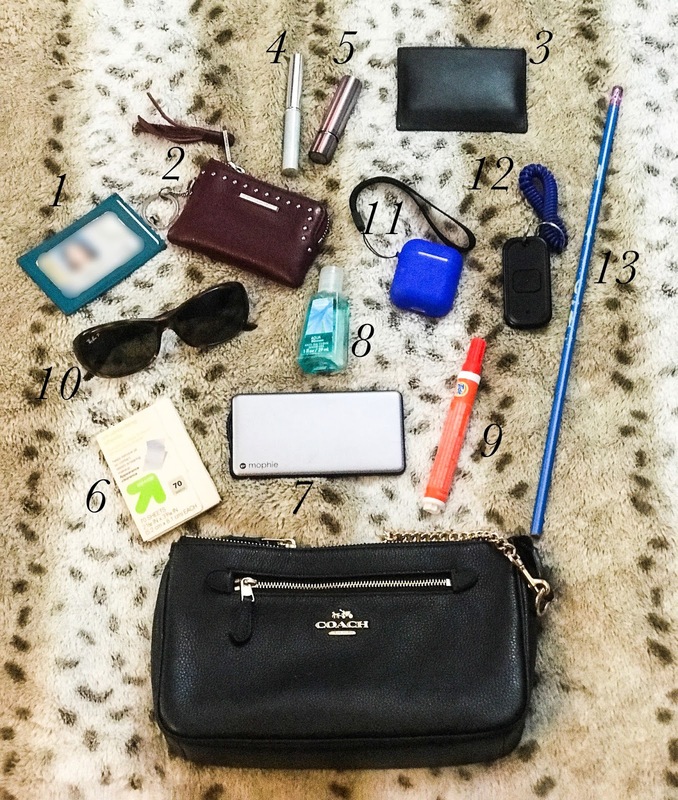 I think it's always fun to read "What's In My Bag" posts - it's interesting to see what other people carry around with them every day, and sometimes I end up buying something to add to mine from someone else's post! I'm very, very particular about my bag. I hang it on my wheelchair, so I have easy access to it, so it has to have just the right kind of handle so that it isn't too long or too short, and so that it doesn't get in the way of my joystick and make driving more difficult. Coach technically calls this purse a wristlet/clutch, but it's the perfect size for my needs! I love pouches and card holders. I have one for my ID and credit card (1, above) , so that I can easily throw it from bag to bag when I want to use something else for a night. I have a zippered pouch for my cash and important cards like insurance (similar here) (2), and other things I use more regularly. And then I have one more card case (here) (3), that has store rewards cards and gift cards that I don't use as often. I like that it keeps it more organized, but it's smaller and lighter than a wallet, so it's easier for me to pull out of my bag on my own. There is always a variety of lipsticks in my purse; I just keep throwing more of them in and then eventually clean them out when it gets to be too many. The ones always in there, though, are my MAC Tendertalk (5) and my Clinique Black Honey (4). I'm not really a big lipstick person, and these are the perfect balance, with a balm-like texture but some color, too. I'm never, ever found without my Mophie battery (7), Bath and Body Works hand sanitizer (8), blotting papers (6), and a Tide pen (9). Instagram uses a lot of phone battery, plus e-mails and texting... my phone never makes it through a full day, and the Mophie gives me the extra phone juice that I need. Coffee spills require immediate attention, and my face is super oily and needs blotted after just a few hours. I'm not picky, though - any brand will do (and a toilet seat cover will do in a pinch)! And of course, I have my Ray-Ban sunglasses (10) and my AirPods (11). I've had this pair for more than five years now, and they're my go-to sunglasses. I wear them all the time! I've talked about the AirPods before here. Finally, I have my door remote (12) and novelty pencil (13). I know these look crazy, but the pencil is what I use to reach elevator buttons in my office that are out of my arm range! I found it in my basement, and it turned out to be the perfect length. It's not the most high-tech solution, but it gets the job done. And the door opener is for my office - it works like a garage door opener - when I press the button, my office door automatically opens.